This EKG comes courtesy of Dr. Mitch Bellis. A 14 year old male with a history of depression and migraines presents to the ED after ingesting pills. He is obtunded. V/S: Pulse 140, Respirations 28, BP 70/40. 2. What is the antidote for this overdose? The EKG demonstrates a tachycardia with a widened QRS complex with a prominent R wave in lead aVR as well as a prominent S wave in leads I and aVL. This is characteristic of sodium channel blockade from tricyclic antidepressant (TCA) toxicity. This patient ingested Amitriptyline. An empty bottle was found next to him. TCA toxicity causes sodium channel blockade so it slows phase 0 depolarization of the action potential. This results in a widened QRS complex. The right bundle branch normally has a longer refractory period than the left bundle branch. So, when the TCA slows depolarization, it slows it more in the right bundle branch than in the left. That means that after the left bundle is finished conducting the right bundle is still firing. So there is extra conduction towards the right side of the heart at the end of the QRS. It’s almost like a mini right bundle branch block. This results in a rightward shift of the terminal 40-ms of QRS axis and a right bundle branch block pattern. Initial treatment of this patient should include resuscitation with IV fluids and pressors. The antidote for TCA toxicity is sodium bicarbonate. This accomplishes sodium loading to overcome the sodium channel blockade and also accomplishes serum alkalinization. A 21 year old male presents to the ED after having an argument with his fiancé. He presents with confusion and altered mental status x approximately 1 hour. V/S: Pulse 160, BP 130/90, Temp 98.6. 1. What does this EKG show? The EKG shows signs of Na channel blockade consistent with Tricyclic Antidepressant (TCA) Use. Patients with TCA toxicity should be treated with sodium bicarb. The patient presented afebrile with dry mucous membranes, dilated pupils with a disconjugate gaze, disoriented and with incomprehensible speech. He was intubated shortly after arrival. His fiancé brought an unlabeled bottle of pills which she believes he ingested. A “Pill identifier” app was used to identify the pills as amitriptyline 25mg tablets. It is unknown how much he took. TCA toxicity results in blockade of Na channels. This manifests on EKG as sinus tachycardia with widening of the QRS complex. The classic finding is described as a rightward shift of the terminal 40 milliseconds of the QRS axis. This manifests on an EKG as a terminal R wave (positive deflection) in lead aVR and a terminal S wave (negative deflection) in leads I and aVL. On this EKG the QRS complex is approximately 100 ms wide. There is a terminal R wave in lead aVR as well as a terminal S wave in leads I and aVL (see EKG below). 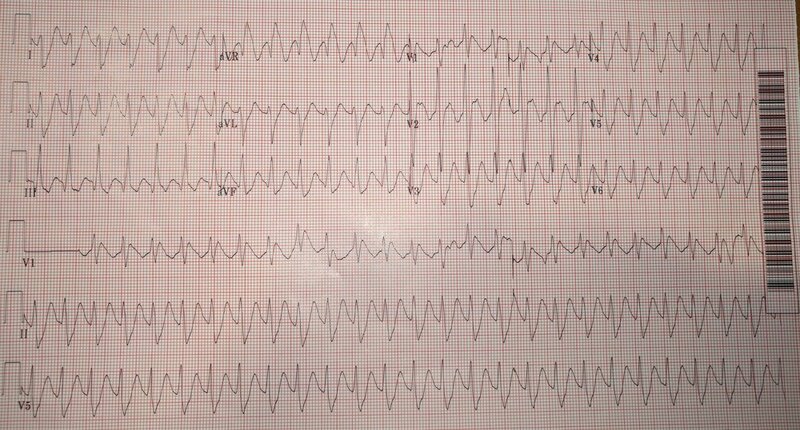 In patients with TCA toxicity, the width of the QRS complex on the EKG is prognostic. If the QRS complex width is <100 ms the patient is not at risk for seizures. If the QRS width is <160 ms the patient is not at risk for ventricular dysrhythmias (Boehnert, Lovejoy, NEJM 1985;313:474). Treatment for TCA toxicity includes sodium bicarb. This is to overcome the Na Channel blockade. It also results in serum alkalinization. If a patient with TCA toxicity develops ventricular dysrhythmias, they should be treated with lidocaine or magnesium. Standard antiarrhythmics such as amiodarone, procainamide and phenytoin, should NOT be used. Our patient was treated with a bolus of sodium bicarb followed by a drip. His post-treatment EKG is below. 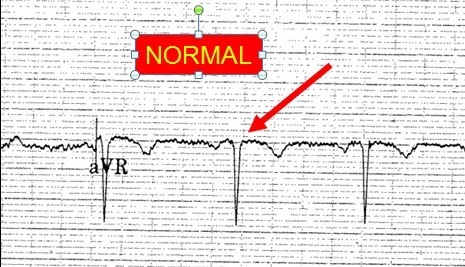 Note that the tachycardia has resolved, the QRS has narrowed and the terminal R wave in aVR is no longer present. The patient stabilized and was extubated the following day. Thank you to out toxicologists Dr. Nima Majlesi and Dr. Benjamin Kessler for their assistance with this write up.